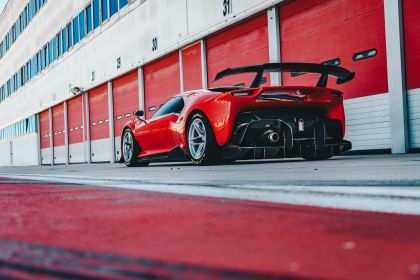 On this page you can find 30 high resolution pictures of the "2019 Ferrari P80/C" for an overall amount of 59.21 MB. 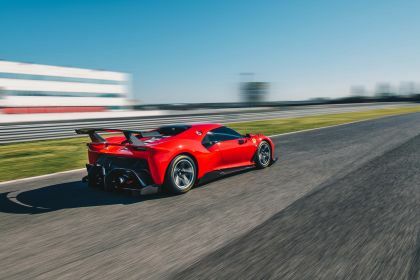 Maranello, 25 March 2019 – Creating an entirely new and modern take on the Ferrari sports prototype concept is both an ambitious and complex undertaking. 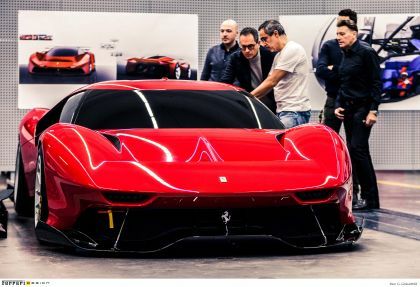 But it was in this spirit, and with very specific input from the client, that the new Ferrari one-off, the P80/C, was conceived. 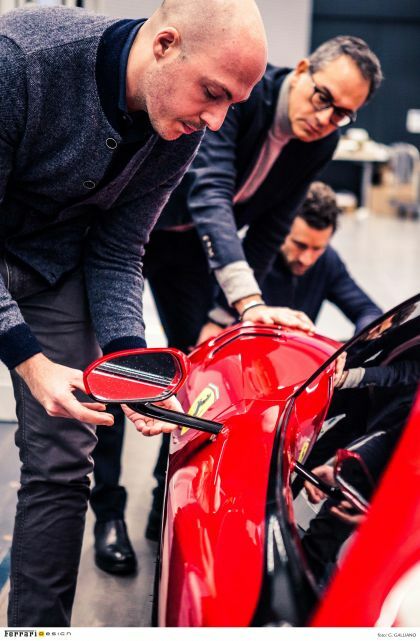 The Ferrari Styling Centre, under the direction of Flavio Manzoni, and the engineering and aerodynamics team worked hand-in-glove with the client, sharing principles and visions in order to create a new “Hero Car” with an absolutely unique and authentic soul. 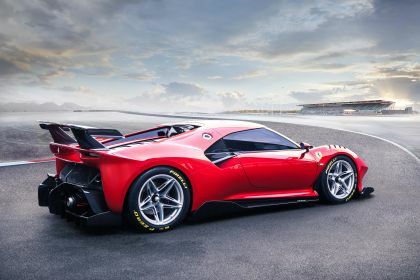 The Ferrari Styling Centre’s goal was to create a resolutely modern car that made no major concessions to the past, apart from attempting to recreate the sensual shape of those iconic models through more muscular wings formed by the intersection of concave and convex surfaces. 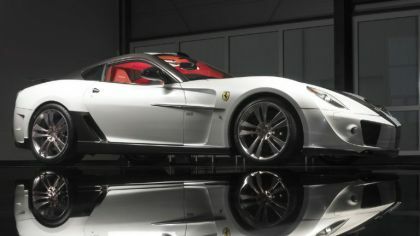 A decisive wedge shape dominates the side view at the front of the car. The muscular forms of the front and rear wings with the cockpit set in between are emphasised by very broad buttresses that expand towards the side air intakes. 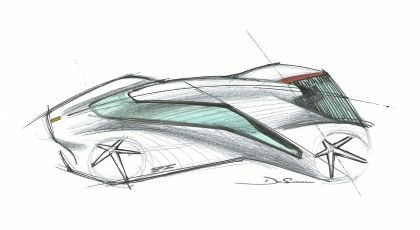 This gives the impression that the cabin is completely fused with the body, and is accentuated still further by the wrap-around windscreen which references the iconic look of sports prototypes of the past. The flying buttresses converge towards the roof underlining the visor effect of the greenhouse. 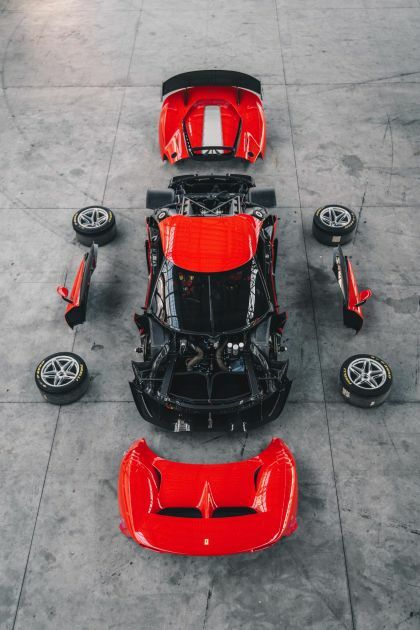 All of these features are references not only to the 330 P3/P4 but also homage to the Dino and the 250 LM berlinettas. 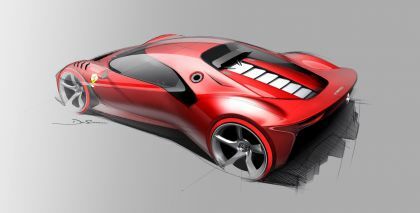 The side windows merge graphically with a wide pocket created by the side air intakes giving a dynamic downward movement to the rear flanks. 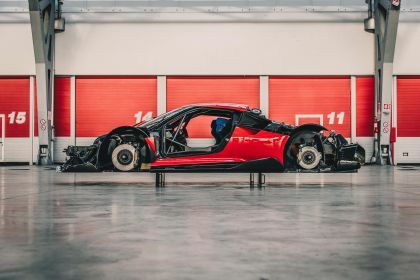 This disruptive line balances the wedge-shaped front flanks and visually separates the rear section from the rest of the car. 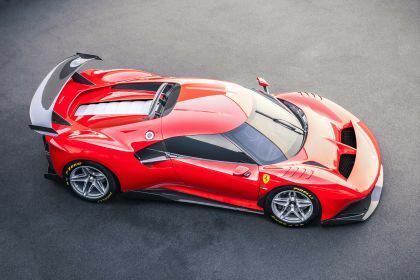 Seen from above, it is clear that the bodywork is widest over the front axle, but then narrows sharply, creating a tightly sculpted waistline around the rear door before broadening out again dramatically at the tail. This particularly iconic kind of architecture is also emphasised by flying buttress-type C-pillars which are physically detached from the cabin. 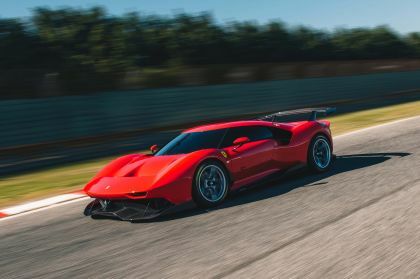 On the one hand, the C-pillars wraparound the intercooler air intakes, while on the other, they accentuate the sharp drop in height between the roof and the surfaces of the rear engine cover. 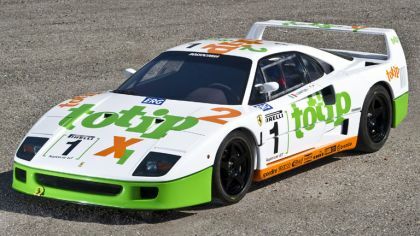 Compared to a more normal continuation of the roofline over the engine cover, a more extreme solution was preferred, creating a large void rear of the cockpit with a vertical rear screen. 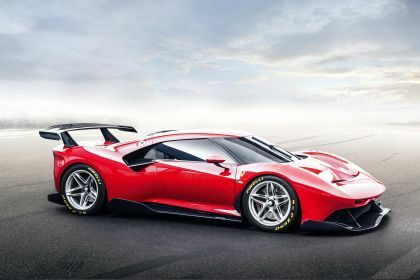 Aerodynamic development was based on the experience gained with the 488 GT3, but was not governed by the restrictions imposed by international regulations. 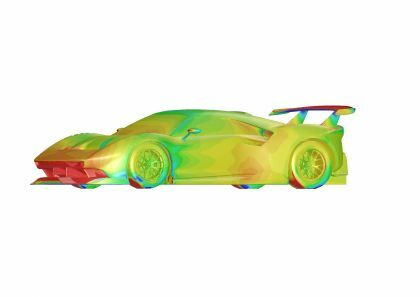 Thus the front splitter is specific and, while the expansion curve and vortex generators of the rear diffuser are the same as those used on the GT3, the external surfaces are all unique to the P80/C. 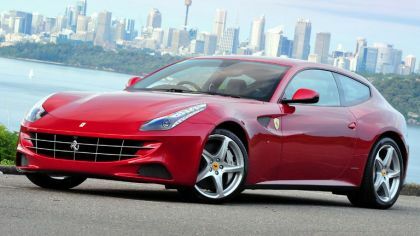 The result is an improvement of around 5% in overall efficiency, required to make full use of the unrestricted engine. 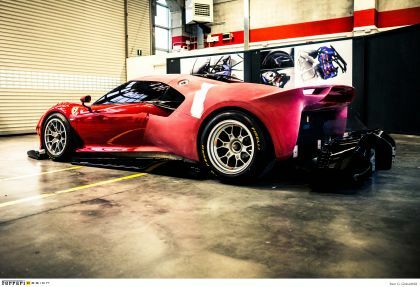 The objective was to balance the upper bodywork’s downforce evenly over the two axles, making full use of the 488 GT3’s underbody. 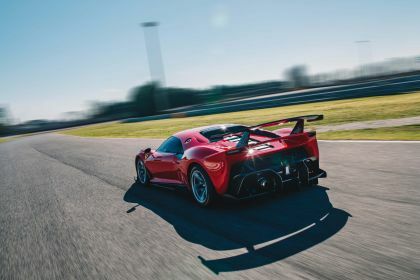 The configuration of the rear bodywork required the adoption of an aerodynamic profile that sits immediately rear of the trailing edge of the roof to provide a strong recompression of the flow rearwards, reinforcing the downforce generated by the tail and the wing. 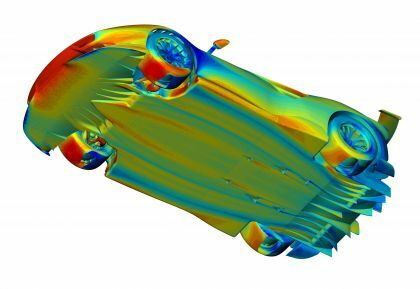 This aerodynamic profile was inspired by the T-wing adopted in Formula 1 in 2017 and here is designed to reduce the length of the flow over the rear, creating the effect of a very short ‘virtual’ rear windscreen and an extremely limited separation bubble. 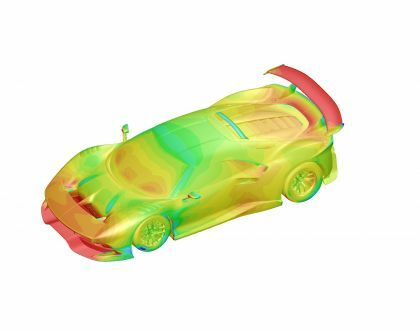 The front of the car has a catamaran-style formal geometry. The jutting effect of the nose is underscored by its almost wing-like shape which the interplay of voids highlights very effectively. 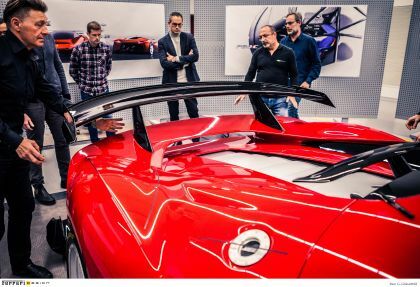 The large radiator air vents are located just behind this wing-like structure and these outlets over the front bonnet underline the powerfully muscular wings. 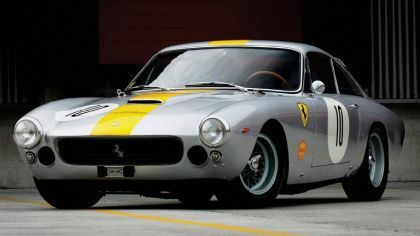 The fact that the P80/C is homologated only for track use meant that it could do without components that would be deemed vital in a road car, and which would also heavily influence its styling. 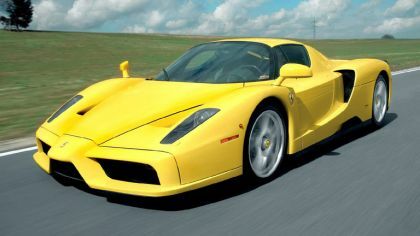 Classic head lights have essentially disappeared. 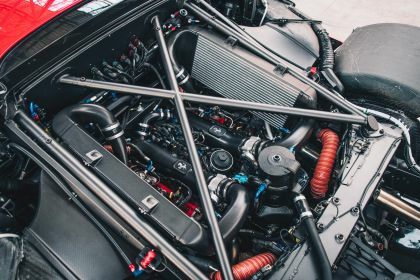 Or rather they have been reduced to mere slits set into niches at the front of the car reminiscent of the air intake housings in the grille of the 330 P3/P4. Unlike the 330, however, in the P80/C, said housings are not set into an oval grille but look more like two pockets carved out of the front of the car. Even the rear fascia, which leaves the running gear fully visible, has a catamaran-type architecture. 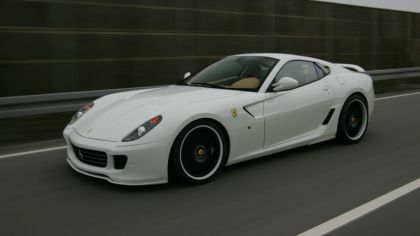 This allowed the inside to be completed devoid of bodywork. 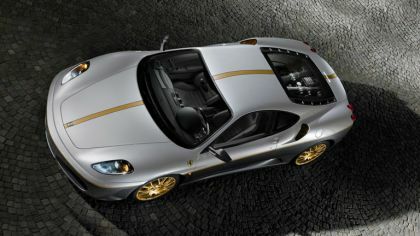 In fact, its sole occupant is a grille to help evacuate heat from the engine bay. 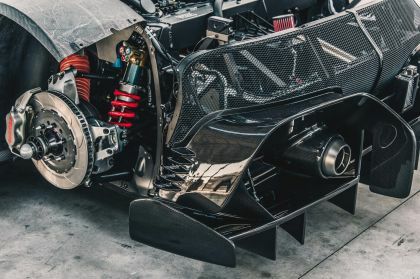 The space left is occupied by a huge rear diffuser which seems almost to be separate from the rest of the car. 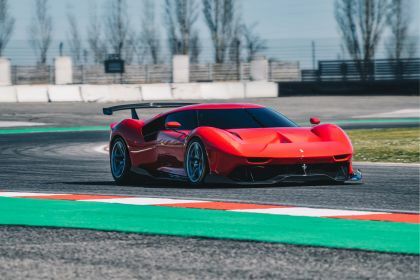 The adoption of a concave rear windscreen and aluminium louvres on the engine cover, a reference to the 330 P3/P4, gives the P80/C’s tail an instantly recognisable and unique look. 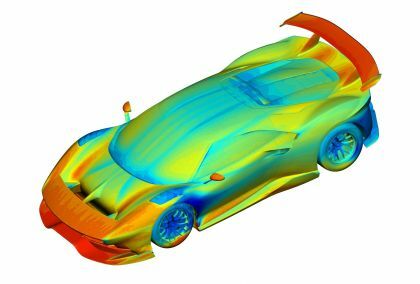 At the client’s request, the car was designed with a dual soul: a racing set-up, which includes quite a showy carbon-fibre wing and 18” single-nut wheels, and an exhibition package complete with 21” wheels but devoid of aerodynamic appendages, to highlight the purity of its forms. The P80/C’s design language was crafted to be instantly clear. 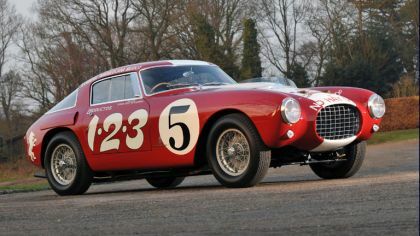 Although made entirely from carbon-fibre, only the parts with strictly technical functions have been left bare, while the main car body has been painted a bright statement Rosso Vero. 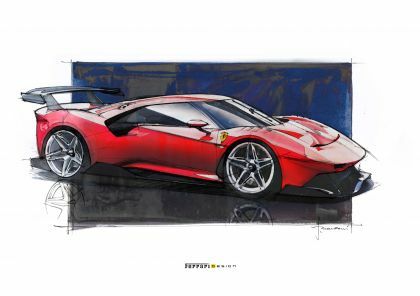 The name was chosen by the client, proving that his loyalty to Ferrari’s sports prototype tradition extends all the way to colour. 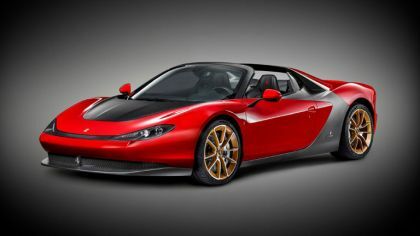 The interior is very much the same as that of the donor car with a roll cage integrated into the bodywork. 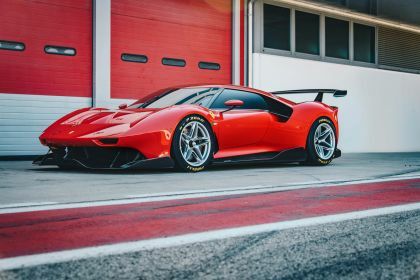 The side sections of the dashboard have been redesigned from the version seen on the 488 GT3, as have the seat upholstery and door panels – the latter are now carbon-fibre shells and no have no impact on the car’s weight.